It’s easy to get so wrapped up in the pursuit of treasure, talking about the benefits of my next imaginary drop and how awesome my character will look that I lose sight of how fun it is to acquire it to begin with. 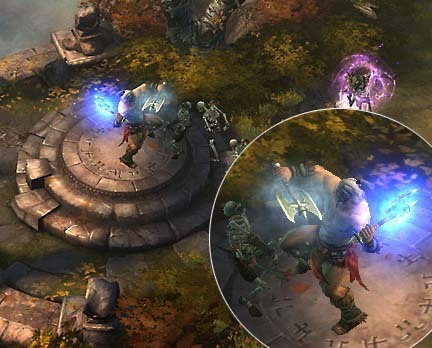 Diablo III’s combat holds up over the lengthy campaign because of its randomly generated dungeons and monsters. One second you’re exploring a narrow cave passage densely packed with tiny demons, the next you’re deftly dodging and luring gigantic titans into vast open deserts. Play the same section of the game again and you might face the giant enemies in the tight space, while the swarms of enemies come at you from all over the desert. Or maybe another time you’ll face something altogether unexpected, such as a special enemy with abilities you haven’t seen before. Each time you play certain areas tied to the story might be laid out in the same way, but levels -- and the enemies that populate them -- are largely unpredictable. Never knowing what to expect keeps you on your toes, with your doom potentially hiding behind every breakable door. It just adds to the sense of adventure, and makes you feel like an empowered and emboldened hero if you manage to take down all your foes. But your hero would hardly be heroic without his wide array of abilities, which are doled out at just the right increments, and not connected to any permanent choices. Every time your character gains an additional level in his journey to the cap of 60 he either obtains a new power, a rune that augments an already unlocked power, or a passive ability. Every time you level it feels significant, and, because there’s no penalty for switching out one power or rune for another, experimentation happens naturally in order to adapt. If I’m fighting waves of weaker enemies I’ll use an ability set that does damage over wide areas, while moments where I’m facing a boss or an another large enemy encourages me to quickly swap these for skills suited to taking on a single target. Runes are an especially great way to handle skill augmentation, too, because skills you get early on that may seem useless can suddenly become amazing later in the game. For instance my witch doctor has a skill that summons frogs, but with runes I can summon one great frog that consumes an enemy whole, or make it rain frogs from the sky and poison enemies over time. With five runes per skill, my witch doctor feels super versatile, able to adapt to take on most anything Diablo III sends his way. One second he’s a life-leeching summoner with a legion of undead followers to tank for him, the next he’s a high-damage dealing caster with great support skills to help my teammates. With so many skills and versions of them it could get intimidating, but runes are introduced very slowly, and over multiple playthroughs. It’s a really smart way to handle an otherwise intense learning curve, and to make combat so engrossing that its repetitiveness goes largely unnoticed. As big of a fan of approachability as I am, a little more explanation of some of Diablo III's deeper features would be appreciated. Namely, it should very clearly and deliberately point out the inclusion of Advanced Tool tips and Elective Mode. The former details how your skills work in more detail (such as how your weapon's damage might affect a skill, for instance), while the latter allows you to completely customize which skills go on which of your six buttons. If you don't enable Elective Mode you're locked into a few skill options per key, which is great for people who are learning the ropes, but something anyone will want to change after a few hours. The days where big-budget titles could be made for “l33t” gamers are over, and while I applaud Blizzard's efforts to make Diablo III a game most anyone can play regardless of previous experience with the franchise, they do need to let more advanced players in on these features without having to hunt for them. 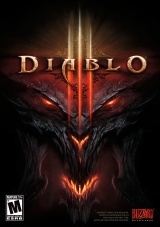 For the experienced player, one time through the campaign of Diablo III just isn't enough. With randomly-generated areas and monsters, as well as a range of difficulties to play on, there are always more battles and loot waiting. While the first time you battle your way through Act I you might find one chest, and fight a pack of champion monsters just before it, the next time you might find three gargantuan demons – you just never know until you try. The entrancing allure of the unknown -- that you might stumble upon something unexpected – fills me every time I start a game. Add to that additional difficulty levels, where monsters gain powers you've never seen, and in combinations that make them genuinely threatening to your hero who moments before seemed superpowered, and it becomes an experience where excitement is around every corner, and adventure (or death) is just waiting for you to find it. 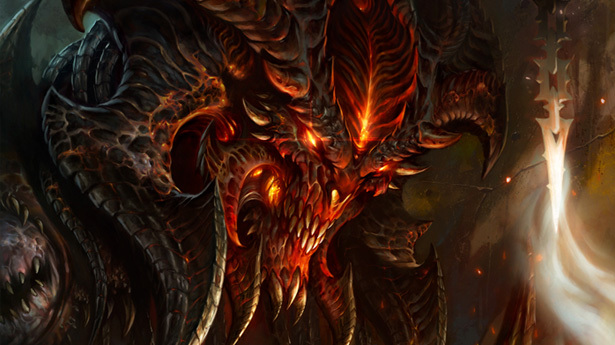 At IGN we praise many games for their replayability, but Diablo III, with its continuous class progression across multiple difficulties, as well as its randomly generated dungeons loot and monsters, really stands in a class of its own. Even on harder difficulty levels you can play the entire campaign alone, but Diablo III makes it easy to play around with friends or total strangers. Because it's always online, you can quickly bring up your Battle.net friends list, joining another's game or inviting up to three others. It's simple, intuitive and very, very fast. Then once you're together you can teleport to one another from town, slaying monsters who become tougher with each player that joins the game. Multiplayer isn't always conducive to getting the most out of the narrative (players who skip the story skip it for everyone, and you can't bring AI controlled companions in multiplayer), but can result in epic moments where everyone excitedly links the loot they just got, brokering deals or just giving it freely in order to make the party stronger. Killing a boss alone is gratifying, but doing it with others results in tall tales and all kinds of unpredictable hilarity. The good times don’t become hampered by people stealing loot from one another, either, as Blizzard has wisely made it so the only loot you see is your own. If you want to share items you can drop it from your inventory or trade it. There’s no fighting about who gets what; instead everyone just focuses on enjoying the battles and reaping their rewards. An integrated voice client would have made things even more convenient, but regardless it's still great always feeling connected to your circle of friends, sharing links to your loot whether or not you're in the same game, or just killing time chatting. Twelve years. Twelve long years of waiting and fans are finally playing Diablo III, and, if my recent marathon sessions are any indication, they will be for the foreseeable future. So many systems from previous Diablo titles have been improved, making for an approachable, rewarding and deeply satisfying treasure hunting game. It's addictive on a level few games can match, so much so that it's easy to largely overlook its flaws. Sure, if you want you could really nitpick Diablo III’s design, but ultimately any minor grievances seem so trivial when compared to the enjoyment I had and will continue to have with Diablo III for years to come.